The Serbian rule over Belgrade began in 1284, when the Serbian king Dragutin, son-in-law and vassal of the Hungarian king Ladislav IV was given rule over Mačva and Belgrade. It was a period of intensive settling of Serbian population and increasing influence of the Serbian Orthodox Church. Dragutin's court was in Belgrade. Newly built Cathedral was a symbol of power and wealth of the young Serbian state. After Dragutin's death, his brother Milutin came to the throne, but he has ruled over Belgrade for a short time, for in 1319 it was captured and totally destroyed by the Hungarians. Demolished and abandoned town became a border foothold of Hungarian resistance to expansion of the Serbian state from the south, in the time of Czar Dušan. In that condition Belgrade enters the XV century, when the Turks, a new conquering force, appeared on the historical stage of Europe. 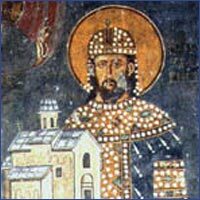 In strong desire to get as prepared as possible to resist Turkish invasion and to have a powerful stronghold on the Sava and Danube, the Hungarians allowed construction of Belgrade during the rule of Despot Stefan Lazarević. He ruled over Belgrade from 1403 until 1427 and that was the time of a real prosperity of this town. Belgrade was not only the capital of the Serbian state, but also the most important economic, cultural and religious center. The following buildings were erected: the Metropolitan Church, a new fortress (citadel), the Despot's Palace, a hospital and a library. Merchants were granted privileges, and wealthy and capable men came to the town and contributed to its prosperity. Belgrade is supposed to have had about 40-50,000 inhabitants in that period. The Despot's successor Đurađ Branković was forced to surrender the town to the Hungarians. Following the example of the Belgrade fortress, he built the Smederevo fortress. During the hundred years of Hungarian rule the whole population structure was changed as well as shape of the very town. The town abruptly became stagnant, while the expelled Serbian population lived in the suburbs and was not allowed access to Upper Town. The Hungarian king Sigismund increased the Hungarian population and the influence of the Catholic Church.